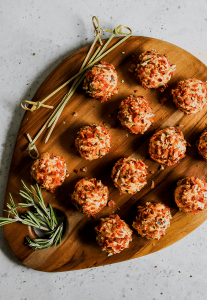 Pimiento cheese is a religion in the south so while lightening it may be considered adultery to some, this healthier version of the classic is sure to get you back into church! 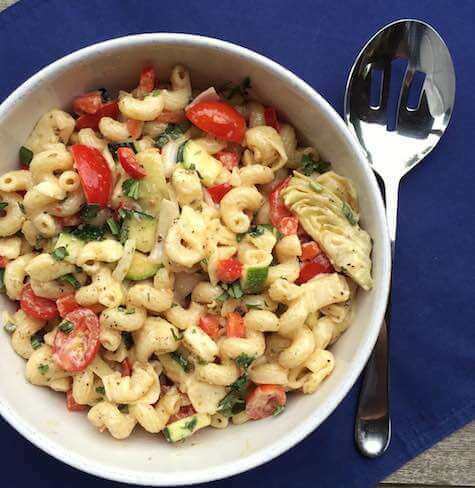 Try it today with toasted baguette rounds, mini bell peppers, or sliced pear. 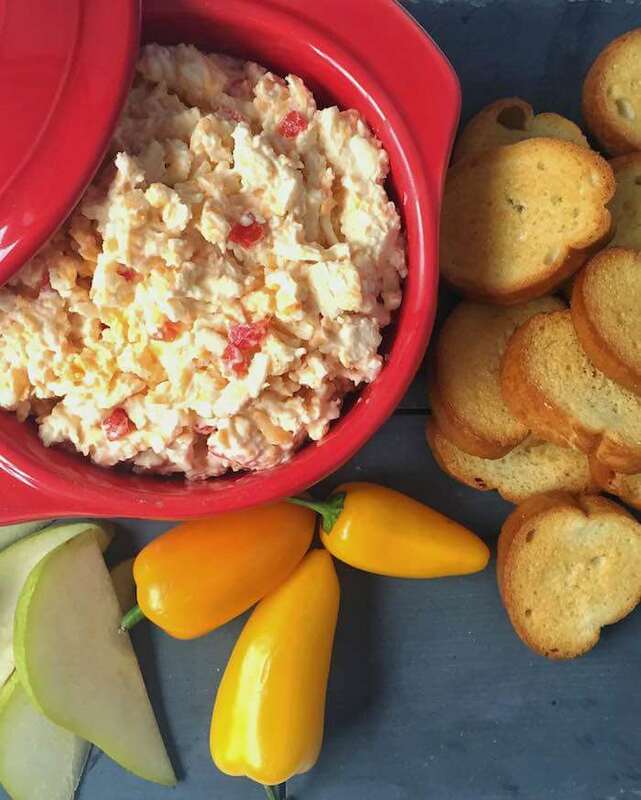 People in the south are VERY particularly about their pimiento cheese…even just the spelling leaves rooms for debate (is it pimento or pimiento)? So taking a classic pimiento cheese recipe and (gasp) adulterating it by making lightened pimiento cheese is almost unheard of. BUT, stay with me here, because when it can be lighten WITHOUT losing any of the flavor or creamy qualities that people hold so dear, then why not? I love hearing stories of how people’s parents and grandparents made their secret family recipe. Did it add Worcestershire? What about grated onion juice? This recipe has both as well as a small squeeze of fresh lemon juice to brighten up the flavor. Sometimes I will use one block of reduced-fat sharp cheddar and one block of full fat. Other times I cut the mayo and go all Greek yogurt. There is plenty of room for interpretation so definitely share in the comments how you modified so I can make sure to try it. Once you try this recipe and decide it is going to be your new secret family recipe, play around with how you serve it. 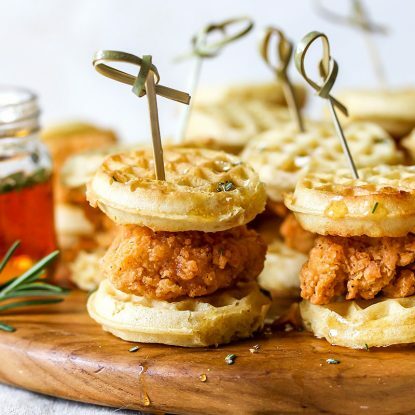 I share some of my favorites below: Southern Pimiento Cheese Canapes, Pimiento Cheese Pepper Poppers, Bacon Pecan Pimiento Cheese Truffles, and Pimiento Cheese Sliders. So many options for such an easy recipe! Regardless of how you choose to make it, there is one cardinal rule that you MUST adhere to: grate your own cheese. Please! Skip the pregrated and do just do it yourself. It makes a world of difference in the final recipe. In a large bowl, stir together first 7 ingredients (Greek yogurt through red pepper) until well blended. Shred the cheese using a box grater or at medium speed with a heavy-duty electric stand mixer. Add shredded cheese to mayonnaise mixture, stirring until blended. Store in the refrigerator for up to 1 week. 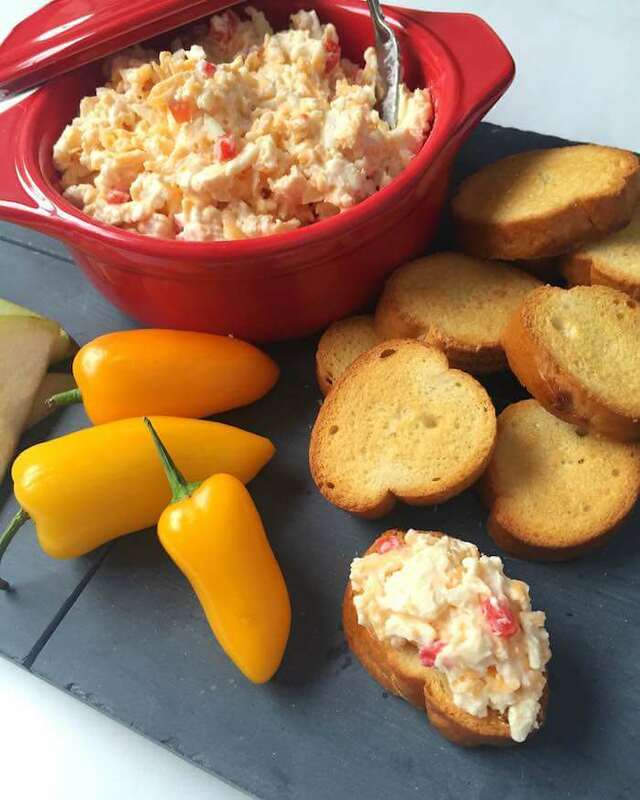 Looking for more ways to serve Lightened Classic Pimiento Cheese? 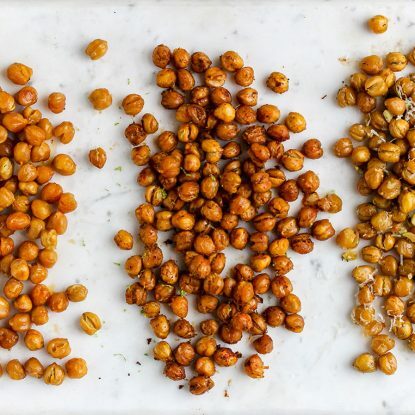 Try one of these delicious ideas to bring your recipe to the next level! 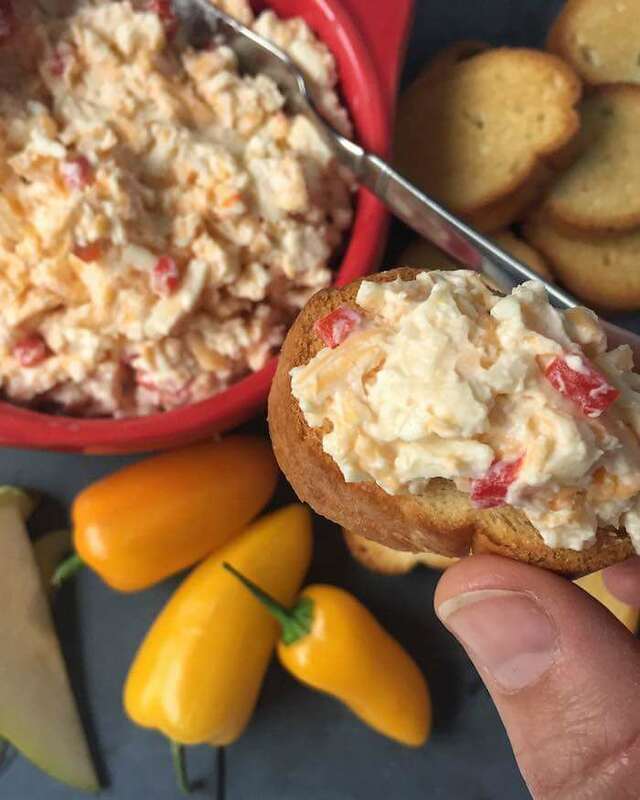 Southern Pimiento Cheese Canapés: Spoon 1 tablespoon pimiento cheese onto 1 toasted baguette rounds(or English cucumber slices, cornbread crackers or party pumpernickel may also be used). Sprinkle with 1 teaspoon finely chopped bacon pieces, 1 teaspoon toasted chopped pecans, and top with 1/2 of a grape tomato, sliced lengthwise. 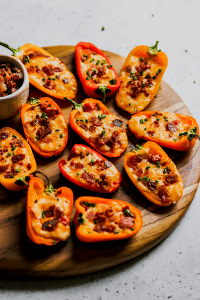 Pimiento Cheese Pepper Poppers: Cut sweet mini bell peppers in half lengthwise leaving the stems intact; remove seeds. Spoon about 1 tablespoon pimiento cheese into each pepper half. Serve immediately or broil until cheese is golden and bubbly. 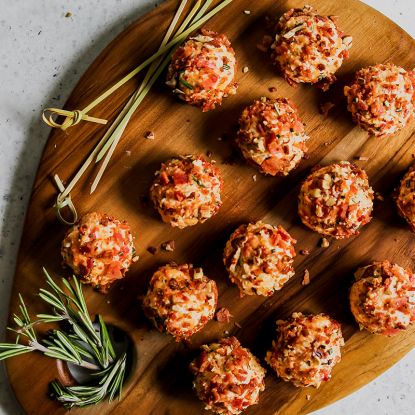 Bacon Pecan Pimiento Cheese Truffles: Roll pimiento cheese into balls then roll in toasted pecans and crumbled bacon. Sprinkle with fresh rosemary. 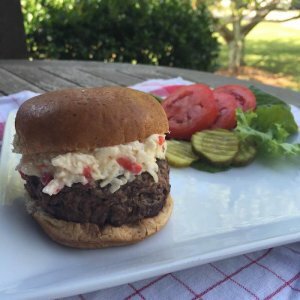 Lightened Up Pimiento Cheese Sliders: Top warm sliders with cool pimiento cheese for an over-the-top burger that is small in size but bursting with flavor. I made Pimento Cheese for the first time this past summer for a “southern food” theme party. What a revelation. So delicious, but so decadent. Love having a lower fat option. You’ll definitely have to give this one a try. I love the versatility! What else did you make at your Southern party? So fun!